Crude oil prices today (Wednesday) fell slightly in response to a new inventory report from the Energy Information Administration (EIA). At 10:30 a.m., WTI oil prices were down 0.7% to $60.83 a barrel. Thanks to the dollar's weakness yesterday, WTI futures settled at a 2015 high of $61.26. Brent oil prices fell 0.97% to $65.56 a barrel this morning. The international benchmark lost 2.4% last month but has gained 0.1% so far this week. 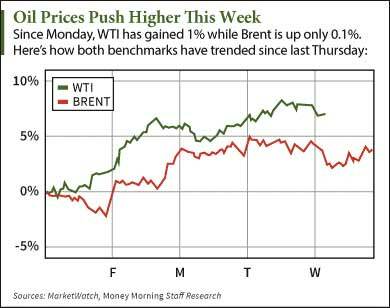 The slight drop in the crude oil prices today came on the heels of the EIA's new supply data. The agency reported a decline of 1.9 million barrels in stockpiles last week. The decline fell short of Platts-polled analysts' expectations of 2.4 million barrels. "Inventories would very likely continue its decline as refinery capacity should continue to remain high," noted Daniel Ang, analyst at Phillip Futures, to MarketWatch. "We haven't seen much disruption in refinery activities, suggesting that the current high inventory of crude in the U.S. would likely be refined at 'full speed.'" Despite today's pullback, investors are still focused on long-term movement rather than the crude oil prices today. OPEC is holding its semiannual meeting this Friday with both OPEC and non-OPEC producers. It will mark the first official meeting since the cartel's Thanksgiving announcement to maintain daily production at 30 million barrels amidst falling prices. The cartel is likely to maintain output levels again as countries like Saudi Arabia still try to defend its market share. But according to Money Morning Global Energy Strategist Dr. Kent Moors, Saudi Arabia is losing control of OPEC. The nation increased production from 9.71 million barrels a day in February to 10.1 million in April. Over the same period, Nigeria's production slowed from 1.83 million to 1.8 million and the United Arab Emirates' output was unchanged at 2.84 million. You see, the Saudis are trying to desperately thwart other members by portraying rising production as a cartel-wide phenomenon. In reality, Saudi Arabia is alone. And it showed in OPEC's April market report. "What is taking place within OPEC's ranks is shaping up to be the most important new direction in years," Moors explained. "It is a story that is growing with each passing day, signaling a changing of the guard in oil and a broader restructuring in the energy space as a whole." Keep checking Money Morning for updates and stories on crude oil prices today and OPEC's meeting on Friday.